Full length native protein (purified) corresponding to Human Serum Amyloid P/SAP. 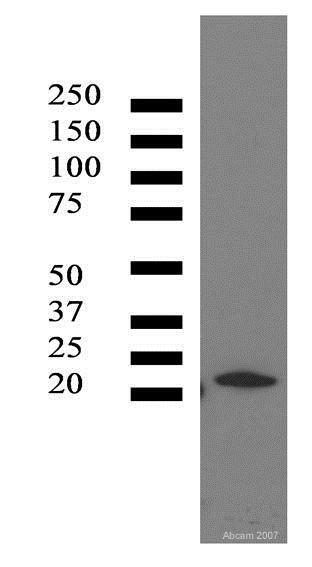 This antibody reacts with Serum Amyloid P / SAP coated on microtitre plates. In western blots of SDS-PAGE separated serum proteins, the antibody reacts with a high molecular weight aggregate of Serum Amyloid P / SAP under non reducing conditions, and reacts strongly with a 25 kDa band of the single subunits under reducing SDS-PAGE conditions. Previously labelled as Serum Amyloid P.
This antibody reacts with serum Amyloid P coated on microtitre plates. In western blots of SDS-PAGE separated serum proteins, the antibody reacts with a high molecular weight aggregate of serum Amyloid P under non reducing conditions, and reacts strongly with a 25 kDa band of the single subunits under reducing SDS-PAGE conditions. Our Abpromise guarantee covers the use of ab27313 in the following tested applications. Sandwich ELISA 1/4000. Can be paired for Sandwich ELISA with Rabbit polyclonal to Serum Amyloid P/SAP (ab17872). Use as Capture antibody with recommended pair. See Abreview submitted by Jennifer Webster for details. WB 1/400. Use under non reducing condition. Predicted molecular weight: 25 kDa. ELISA 1/4000. Use at an assay dependent dilution. Found in serum and urine. Note=SAP is a precursor of amyloid component P which is found in basement membrane and associated with amyloid deposits. N-glycosylated with a complex biantennary oligosaccharide chain with a sialic acid at the end (disialo-SAP). Monosialo-SAP as well as asioalo-SAP are also detected (PubMed:15174148). Publishing research using ab27313? Please let us know so that we can cite the reference in this datasheet. I will be submitting an order shortly for product AB27313 and was wondering if you had lot 682943 available. Please let me know. Thank you for providing me these additional details. I am sorry to confirm that we don't have any different lots in stock at the moment. I would like to reassure you that we monitor feedback closely on a weekly basis and we are not currently concerned about the general quality of this antibody or this batch. Regrettably, I can suggest you have received a bad vial on this occasion. Your order was for four vials of this product, were you able to test any of the additional vials to see is they reacted in a similar way? I hope this will be helpful. I look forward to hearing from you with details of how you would like to proceed. Good morning, We received several vials of lot GR66918-1 that did not work for us, and we have 3 remaining. Would we be able to have these replaced with a new lot number? The reference purchase order number is 30336, and the abcam sales order is 1004941. Please let me know what additional information you may need. I am sorry to hear you have been experiencing problems with one of our antibodies. The quality of our products is important to us and I would like to reassure you that we investigate all customer complaints. I appreciate the time taken to submit further information to us, and after reading the answers provided I would like to ask some additional questions. We currently do not have any other lot of this product. To determine whether this product is covered by our Abpromise guarantee I would appreciate it if you could provide me information about your experiments including the tissue type, application and specifics about the protocol that you use. I look forward to receiving your reply. Therefore if suggestions do not improve the results I would be happy to offer a refund or replacement vials, please keep the unopened vials at -20C as we may ask to have them returned to us. Please do not hesitate to contact me should you have additional questions.